Aerial photography drone manufacturer DJI just released its latest drone on Tuesday—the $1,399 Phantom 4—and the reviews are already overwhelmingly positive. 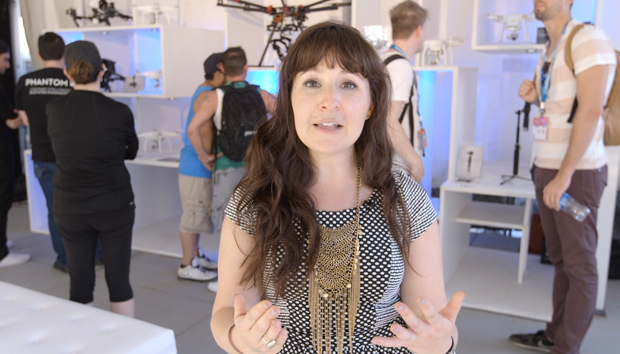 “The drone for everyone.” “Outsmarts bad pilots.” “Blazingly fast and almost crash-proof.” So when I came across DJI’s pop-up shop and flying cage during South by Southwest Interactive, I had to take the Phantom 4 for a spin and test these claims for myself. How easy is it to fly this thing? My drone experience is very minimal—the only ones I’ve tried previously were all largely controlled by an iPhone app instead of a full controller, and I found them to have a pretty steep learning curve resulting in a lot of crashing and struggling to maintain balance (at least for me). But the Phantom 4 was different. Its two joysticks were easy to use and required little effort—one controlled tilt and height, the other controlled direction (backwards, forwards, left, and right). After a quick tutorial from an experienced DJI pilot, I was zipping the Phantom 4 all around the cage in no time. I had no problems keeping it steady when big gusts of wind tried to knock it off course, and I even nailed the landing. The Phantom 4 can even track a subject and follow them around. A companion iPad app showed me what footage the drone was capturing in real time, and also included controls for some of the drone’s more complex features. Two things I wish I could have tried out were its tracking capabilities—the drone will follow a subject around as they move—and TapFly, which lets you tap on a visual destination on the iPad’s screen to send the Phantom 4 in that direction, and it will calculate the best flight path en route. While I can’t comment on how much the Phantom 4 improves on its predecessors (since I’ve never flown any of them), it boasts of a few key feature upgrades: Longer battery life that promises up to 28 minutes of flight time; a maximum speed of 45 miles per hour; and front-facing sensors to assist with collision avoidance. Because it’s a photography drone, the Phantom 4 also packs some pretty high-end image stabilization gear. From my brief time in flight school, I can confirm that the Phantom 4 is, indeed, easy to fly, even for drone noobs. Next time, I’d even consider flying solo, without a co-pilot standing next to me.